It is not an easy task to make a laziest HTPC environment possible. One of the first actions towards that goal certainly involves acquisition of some kind of the wireless remote control to operate HTPC from distance, i.e. from big and soft couch. After trying Lenovo mini wireless keyboard and some remotes from ebay/dealextreme (review: nah), I managed to purchase Rii Mini on ebay auction (maybe 2 or 3 $ less then actual buy it now price, but nevertheless my feeling of financial savvy and victory was impeccable). Let's get to the important parts of the story. Plug&play - you plug it and the computer plays it. You just press buttons at will. Switchable back-light keyboard provides excellent button view in the dark environment, but not too bright to put a strain on your eyes, even if you haven't been out of your dark basement for 7 months. Solid Operating Distance (tested at 5 meters). It's my room limit. Surprisingly solid build - there is no familiar feeling of cheap plastic junk. Automatic standby mode for power conservation. Solid battery stamina (everyday use for about 3 hours on and standby) over a month without charging. Very responsive and usable notebook-like touch pad. Laser pointer for irritating others while you think it is most amusing. Provided USB cable for recharging. 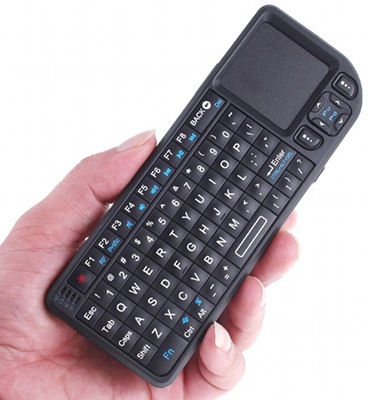 Small and compact USB dongle receiver can be inserted inside keyboard. Goes berserk when battery needs recharging. Sometimes goes unresponsive if some larger object is blocking direct view to the receiver. Need to invest extra effort in order to circumvent this and raise the keyboard above the obstacle. Sometimes does not. The Good/The Bad ratio tells the story. If you need something like this, seek no further. Ebay and dealextreme have various models and prices, but I don’t recommend anything w/o backlit. Or with bluetooth. But my loathing towards the bluetooth is just personal. Some of them leave a hole where dongle is storaged. Some of them are ugly. Some are mean. 1) You are lazy and like horizontal. 2) You need remote for your HTPC. 3) You like to watch movies and tv series in a dark environment.